This map demonstrates that the Library of Congress Federal Research Division needs a budget increase. The other day, I lucked upon a discussion with David Kaplan on National Public Radio, who has written extensively on the topic of international and transnational organized crime. In the wake of the recent Mumbai attack, the discussion addressed the link between terrorism and criminal syndicates. But, toward the end of the 40 minute program, a somewhat different theme took hold. Rather than talking about the relationship between terrorism and organized crime, Kaplan began to talk of terrorism as criminal groups, engaged in illegal activity/racketeering, but with ideological motivations. After having the world’s troubles framed in terms of the “Global War on Terror” (GWOT) for so long, it was interesting to hear a somewhat more nuanced take on complexity of the threats we face. I have always been more of a “struggle against fast changing, transnational networks of nefarious actors”, but it doesn’t make much of an acronym. It has always seemed that it is hard to meaningfully separate terrorism, proliferation, illicit finance, organized crime, human trafficking, and even genocide. One often fuels another, though perhaps from another spot on the globe. 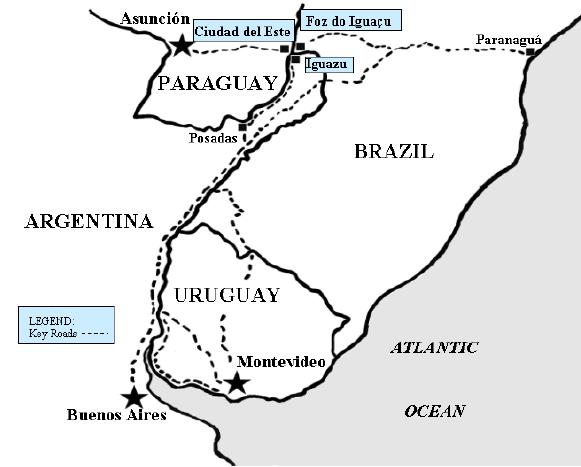 This report (from which the map above was clipped) on the Tri-border Area (TBA) between Paraguay, Brazil, and Argentina captures the co-dependence between nefarious actors of all types. Contrast it with this DoD GWOT type analysis on the same region. While the former may open up the aperture too much for some, I believe it at least gives one a better sense of the actual mechanisms/levers that must be worked in order to dampen bad actors. Perhaps we could evolve beyond GWOT as an organizing concept. It would require more intelligence and properly targeted development resources, but characterizing the problem too narrowly will ensure failure. This evening, I was browsing my hometown paper, the Winter Haven News Chief and found an great little article about the waterskiers at Cypress Gardens being hired to perform all over the world. 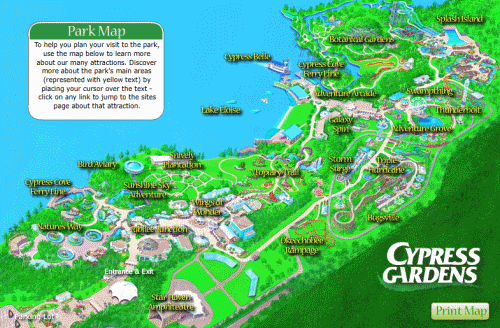 When Cypress Gardens changed ownership (long story) and became less of a classic Florida naturalist park (like Weeki Wachee, Sunken Gardens, GatorLand, Bok Tower Gardens, etc.) and more of a theme park, cost cutting led to the outsourcing of waterski show team. It used to be that all the best skiers at my high school worked at Cypress Gardens (my friend Ryan was Corky the (Waterskiing) Clown for a while). Lets just say that we had plenty of lakes to ski on in my home town. I grew up on Lake Howard, but skied on every single lake in the “Chain O’ Lakes”, and some that weren’t on the Chain. 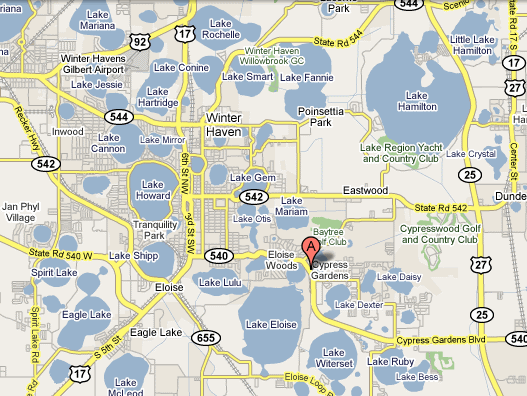 If you zoom out on GoogleMaps, you will see the ridiculous density of lakes in the region. I wish I had pictures for you of Corky the Clown doing a back flip. I don’t know, but I think this sort of thing is some of the best diplomacy America could be doing around the world. Who’s replacing James Glassman at the Department of State? If you know his replacement, do me a favor and send him the link to this blogpost! 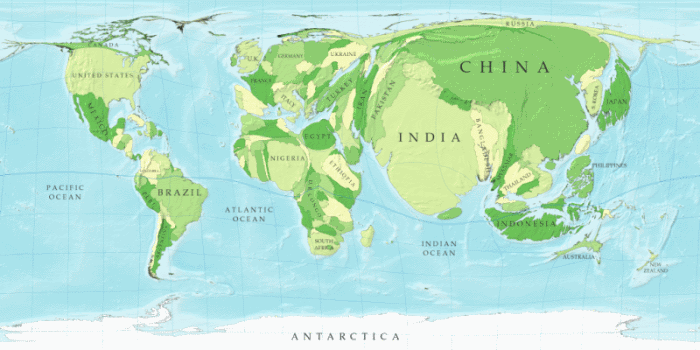 (Geo)graphic provided as part of a great site that you all should visit. I recently read Michael Pollan‘s Omnivore’s Dilemma, which was an huge eye opener in many ways (I highly recommend it). One of the minor asides he made in the book, about the adverse effects of the man-made fertilizers that underpin modern American industrial agriculture, related to an ever growing dead zone in the Gulf of Mexico. I wanted to learn a bit more, so I went to Google (I thought about going to a library…just kidding). 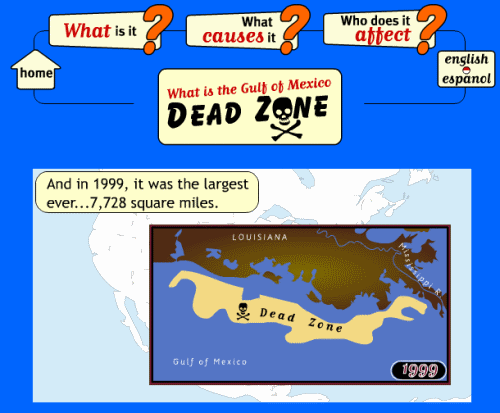 Beyond “Gulf of Mexico”, “Gulf of Mexico Dead Zone” is the most frequent search item proposed by Google Suggest with 229,000 results. Does this strike anyone else as somewhat disturbing? Granted, Google’s search algorithms reflect the most popular searches (e.g., Gulf of Mexico Weather, the next most popular search has 2.1 million items) rather than the most relevant, but come on?! This summer, the Washington Post reported that the kill zone was 8,000 square miles with too little oxygen to support “fish, shrimp, crabs, and other forms of marine life”…which would have been bigger (probably the biggest ever) if not for Hurricane Dolly. This is basically the size of all the waterbodies in the State of Minnesota. Could you imagine if all the lakes in Minnesota were dead? That would make the news. 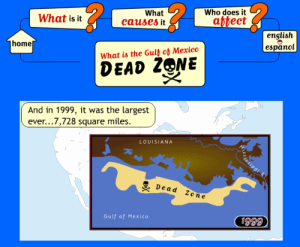 The 2005 Dead Zone was said to be the size of New Jersey! “Hypoxia” is the term, and it is effecting the entire Mississippi watershed. It seems that the past half century or so of industrialized agriculture has externalities that just don’t get covered on the nightly news. I wonder if Archer Daniels Midland would pull their sponsorship if George Stephanopolous covered this issue on ABC’s This Week? That would be a fun social experiment. It was good to hear from Pollan that there are realistic, affordable, alternative modes of agriculture (I think the kidz would call it Old Skool agriculture) that would help mitigate some aspects of the health crisis in the US, while also mitigating the Dead Zone. I saw in a footnote somewhere that Pollan was advising the Obama campaign on agriculture issues (read this article, if you want the gist). I wonder if he will be giving us some change we can believe in?! As a Floridian, I have a bit of a love affair with the Gulf and see this as (let me vastly understate my feelings) unfortunate. I find it interesting that the (geo)graphic provided above is not generated by some Gulf States propagandists, but by the Science Museum of Minnesota. They should be complimented on their self-awareness. 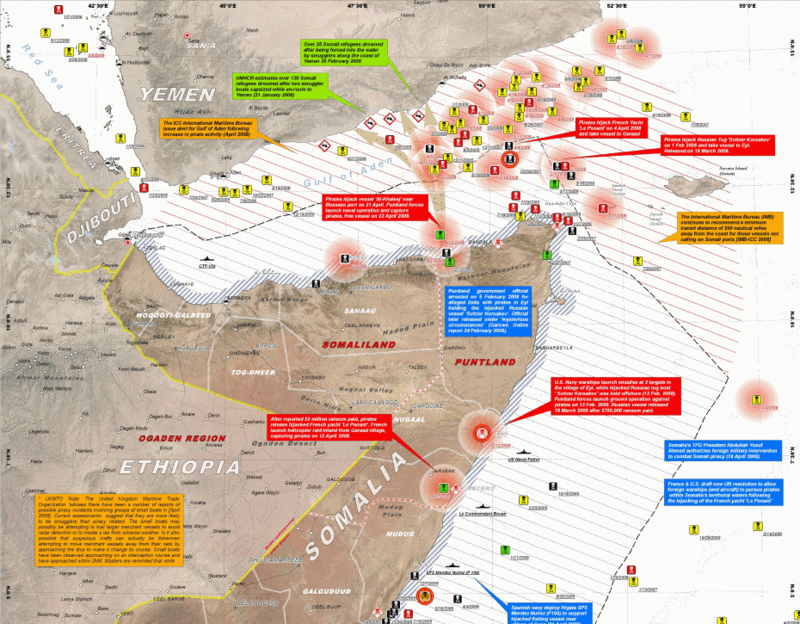 This (geo)graphic accounting of Somali piracy, provided by UNOSAT. Today’s Washington Post article (entitled “The Guns of Anarchy”) by Mark Bowden, the author of “Black Hawk Down,” had a great quote that I felt captured the essence of the sources piracy spanning the Red Sea, the Gulf of Aden and the Indian Ocean, along the coasts of Somalia, Djibouti, Eritrea, and Yemen. His article focused on the persistent state failure that has characterized Somalia for the past 20 years. Rather than actually addressing this state failure in a coordinated fashion with the panoply of soft power necessary to succeed, he noted that the “European Union and the United States have begun to chase pirates more aggressively, but that’s like swatting at bees while ignoring the hive”. Indeed! Mainstream broadcast and print journalists have almost completely ignored the “hive”, but have been very taken with “PIRATES!”. (Personally, I suspect it has something to do with Keira Knightley). It is clearly no fun covering the mess that is Mogadishu (or the rest of the country for that matter), but I fear that there is actually no institutional capacity anywhere committed to thinking through the steps that must be taken in order to overhaul failed states such as Somalia. As Bowden points out, this piracy is “nothing more than the general criminal chaos spilled from land to sea — ply the waters off Somalia’s thousand-mile coastline, so threatening international shipping that they have driven up the price of food and other products throughout the region”. It would be interesting to see a calculation of the costs that this failed state to the world. Typically, failed states only result in things like human suffering, death and dismemberment, contagious disease, and environmental degradation – things we are generally uncomfortable placing a dollar cost on. I know that we don’t like asking ourselves whether saving 100,000 lives is worth $1B in engagement – what should saving lives cost? But, in this case, we can actually run a financial tally of what ignoring people’s well being will cost – the ship manifests lost to the Somali pirates – and we generate a concrete cost for our unwillingness to overhaul and right this failed state. “Both Kenya and Yemen have a vital interest in Somalia, they’re scared to death of a mass migration, which would overwhelm their fragile governments. We run what’s known as a COL camp on a Kenyan naval base in Lamu, Manda Bay. An article by Tom Barnett that came out in Esquire magazine a year or so ago is pretty much spot on www.esquire.com/features/africacommand0707-6. Somalian refugees are routinely thrown overboard a mile or so off the Yemen coastline once the smugglers have been discovered. The USG strikes that occur against al shabaab in Somalia seem to stir the hornet’s nest. Recent suicide attacks in Somaliland and Puntland were troubling since those are considered fairly stable and autonomous regions by Somalia standards. Mogadishu use to have the best italian restaurants in africa, and surprisingly, you would find better cell phone coverage there then you would in some US cities. Bottom line, nothing starts improving in Somalia until the proxy war between Ethiopia and Eritrea is settled and they agree to some sort of compromise on their border dispute. Ethiopian troops pull out of Mogadishu, happening now, and a real UN force (highly unlikely) supplants the token African Union (AU) force that’s there now, basically 2,000 Ugandans and Burandi’s hunkered down at the Mogadishu airport. The estimated number of troops the AU pledged to send was around 9,000, isn’t going to happen, they couldn’t pull it off. M. Rice, the incoming ambassador to the UN, used to the undersecretary of State for African affairs. Hopefully, her efforts will lead to a more stable horn, i.e, an air blockade of Darfur (which the chinese will block at the UN), and a stepped up diplomatic effort with the Eritrean and the Ethiopian border dispute which won’t be easy since Issais kicked out and got rid of everything western including UNMEE, Luftansa, and the Movenpick hotel in Asmarra. I have a friend that’s in Djibouti because she can’t live in Eritrea after she worked for UNMEE and was detained because she was at a bar-b-q with her UNMEE co-workers.